It’s finally here, folks! I know everyone has been waiting patiently for the June metagame report, and I’m extremely happy to bring it to you today. I’ve undergone something of a crash course over these last few weeks familiarizing myself with Sheridan’s methods (and mammoth Google Docs spreadsheet) that allow us to operationalize the tiers in the metagame and track them month to month. Let’s just say I’m truly impressed by what he’s been able to put together, and I hope I can do his work justice with today’s write-up. Since the Eye of Ugin ban that ended the Eldrazi’s reign of terror Modern has been in an excellent place, posting an archetype and deck diversity rivaling any other period in the format’s history. We’re truly in the midst of one of Modern’s heydays, which was on display again in the month of June. Diversity is at an all-time high, and between all the Tier 1 and Tier 2 decks, virtually every type of play style is represented. The large tournaments from this period are less numerous than May, consisting of no Grand Prix and just the one Star City Games Open in Dallas. As Sheridan predicted in the last metagame report, the Tier 1 decks haven’t changed much from the pace set in May, as players turn to the results of those prominent events to inform their deck selection choices. As we’ll see, the more interesting shake-ups took place in the Tier 2 standings, which may portend some things to come in July and onward. Sheridan has outlined elsewhere the methods behind his tiering system, and if you haven’t read the Top Decks page linked above, I highly recommend it. I’m sure I’ll have some more intelligent and/or interesting contributions to make to this dimension of Modern Nexus as I get acquainted with the process, but for now I’m frankly still a little green in that area. I’ll limit my comments here to cover the numbers of decks and events that form our data set. There were only three major events during this period, two SCG Classics and the Open in Dallas, which provided 47 decks. When added to the remaining Top 16 decks and all the minor tournaments, that gives us 633 paper decks across 87 events. MTGO contributed 292 decks from 31 different tournaments—one of these was the PTQ from June 18th and the rest were Leagues. As per usual, these finishes are weighted according to Sheridan’s algorithm (thanks to his wondrous spreadsheet) to give us the respective tiers. Tier 1 decks are those you can realistically expect to see in decent numbers at any mid-sized event. You absolutely must be prepared to face each of these decks, whether that means testing your matchup, dedicating sideboard space to combat them, or simply selecting a deck that matches up well. If your pet deck or brew is soft to a large number of these decks, you’re probably better off leaving it on the sidelines for a sunnier day. On the other hand, picking up any one of these decks is likely to yield success on any given day—if your goal is simply to crush the tournament or finish in the Top 8, each of these decks is an excellent choice. Keep in mind that our tiering system is predicated on concrete results rather than theoretical constructs about a deck’s viability or strength. There’s certainly room for these discussions in Magic, but here at Modern Nexus we want to provide some empirical basis to such claims—while the tiers inevitably reflect “outside” factors such as deck prevalence and variance, it’s also fairly unlikely that anything squeaks into Tier 1 without having a legitimate claim to serious contender. Tier 1 consists of the same seven decks from the May metagame report, plus newcomer Merfolk. 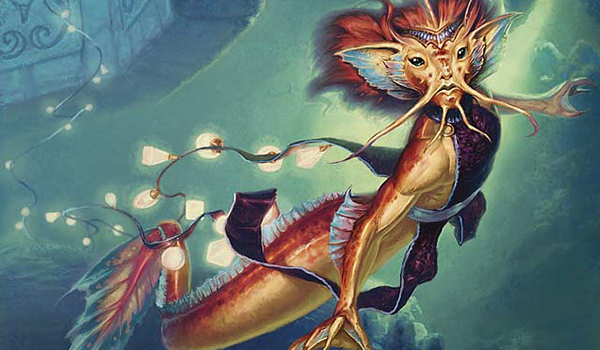 After taking down GP Las Vegas during the previous month, Merfolk has proven its staying power. I imagine there was an uptick in players looking to try out the fishies after their momentous GP win, but it looks like those who did were rewarded with strong finishes overall. The biggest changes we see are the mirrored 2.2% shifts in Infect’s and Tron’s metagame shares, in favor of the former. It makes sense that Tron would decline as Infect is on the rise, as the ponderous big mana deck is rather soft to the Phyrexian menace. That said, it looks as if Infect hasn’t had too much trouble fighting through the Jund and Jeskai decks that likewise occupy a significant part of the meta. A pile of cheap removal capped off with Lightning Bolt may be the deck’s weakness, but Infect is too powerful and resilient to just fold in the face of reactive decks. Likewise, we see Affinity beginning to reclaim some of its lost ground, coming up a full 1%. The only deck out of the aggro trifecta to suffer this month is Burn, down 1%. In fact, if we take the aggressive, linear decks as a whole (Infect, Affinity, Merfolk, and Burn) we see they’re up 2.9% in metagame share. In contrast the more controlling and midrange decks (Jeskai, Jund, GR Tron, and Abzan Company) are down a total of 3.7%. It would seem that linear strategies are on the rise, to the detriment of those trying to play fair. The loss of metagame share for the fair Tier 1 decks is even more pronounced on MTGO. I suspect this has something to do with the rise of Dredge and Death’s Shadow Zoo. These two decks have experienced a massive surge in MTGO results, which doesn’t bode well for people trying to durdle. While Jund and Jeskai should post positive results against Death’s Shadow Zoo due to their interminable removal suites, their Dredge matchup looks to be downright abysmal. GR Tron in particular seems ill-suited to fight through the developing environment—it posted a flat 0% of the MTGO metagame share, and indeed may be on the way out. As I’ll elaborate on below, I think the MTGO results may be something of a canary in the coalmine regarding proximate metagame developments. As for Merfolk, you’ll note that it jumped less than a full percentage point to reach its new Tier 1 status. This indicates the archetype was on the rise during the prior month, and further cements the narrative that the deck is here to stay. In a certain sense, the Tier 2 decks are the heart of Modern. These are the decks that can succeed on any given day, even if they aren’t posting truly dominant results. Pilots deeply invested in these archetypes, or those who carefully read their local metagame, can deploy them to devastating success. And we often see these decks cycle in and out of Tier 1 status as the metagame shifts, proving that Modern really is about playing what you know and love. You won’t require an encyclopedic knowledge of these decks and their strategies to compete in a Modern tournament, but you can’t be surprised to face them either. You’ll want to formulate a general plan for each, or at minimum understand the basics of what the deck’s trying to accomplish and how it interacts with your chosen archetype. Sheridan explained in May’s metagame update that a large gap between the lowest Tier 1 deck and the highest Tier 2 deck might represent a settled metagame. Here we see that same phenomenon present, with Death’s Shadow at 3.1% clocking in a full percentage point below Abzan Company’s 4.1%. It would appear the Tier 1 is relatively ossified for the time being, but we know that any of the Tier 2 decks can shift upwards, and they’re all viable. As with past months, diversity is on display. From grindy two-for-one control strategies (Grixis Control), to full-on combo (Ad Nauseam), to combo-aggro hybrid (Death’s Shadow Zoo, Dredge), to combo-control hybrid (Scapeshift), to traditional aggro and midrange decks of all stripes (Delver, Eldrazi and Taxes, Gruul Zoo, Abzan), you can truly play whatever suits your fancy. Remember how I said we’re in a Modern heyday? As alluded to above, the biggest story this month in Tier 2 territory is the rise of Dredge and Death’s Shadow Zoo. Death’s Shadow has cycled between Tier 2 and Tier 3 in the past, and looks to be benefiting from the same trend pushing the other linear strategies up. Dredge, for its part, is a relative newcomer, at least in its Prized Amalgam iteration, and early indications show that it may be a true monster. Nowhere are these trends more clear than in the MTGO data, where we see a whopping 8.4% and 12.9% metagame share for Dredge and Death’s Shadow respectively. In May the Valakut decks seemed to be doing rather well. Both RG Primeval Titan and Temur Scapeshift variants were represented on the Tier 2 standings, and taken together as one archetype they would have made Tier 1 at a combined 6.5%. Now it seems Titan Shift has fallen down to Tier 3 and Temur builds are suffering slightly too—together they make up 3.6% of the metagame, almost half their collective presence the month before. However, this change runs parallel to the appearance of Through the Breach in the Tier 3 standings. If we fold that into a single category comprising decks built to kill with Valakut, the Molten Pinnacle, it comes closer to the May shares at 5.9%. If slow and reactive decks are losing ground in the current metagame, it stands to reason that Valakut players would pivot towards the more explosive and non-interactive Titan Breach builds that elect to eschew Scapeshift entirely. For next month’s update I intend to delve a little more into this question and see if our Valakut archetype categories are yielding distorted results. You can’t see this just looking at the data above, but the community at large seems to have found the optimal Eldrazi builds for the post-Eye world. The category labeled “Eldrazi” incorporates a few errant Abzan and RG builds, but the lion’s share are in Bant colors. This makes sense given the strength of the blue and white Eldrazi creatures (especially the Drowner of Hope/Eldrazi Displacer interaction)—but I believe the real reason for Bant’s predominance is the presence of Noble Hierarch. After losing (most of) its busted mana base, the post-ban Eldrazi deck is really hankering for a mana dork, and Noble delivers in spectacular fashion. Exalted fits in nicely with the deck’s stompy-like beatdown plan, and conveniently taps for all the colors of the best Eldrazi. Noble increases the number of turn two Thought-Knot Seers and turn three Reality Smashers, and gets the edge over signets for coming online a turn faster. The old Legacy player in me feels a slight shudder as I write these words. Dredge has arrived, and the deck is no joke. It has gone from fringe pet deck, to promising newcomer, to legitimate scourge of the MTGO queues (where it shares the Tier 1 limelight with Jund, Infect, and Death’s Shadow) over the course of a few short months. June was when the deck really started to get press too, and we may see this phenomenon become even more pronounced in July. The performance of Dredge is especially striking when you look at its paltry 0.6% paper shares. MTGO has long been ahead of the rest of the Magic world in its metagame iterations due to the high level of competition and near-constant grinding, and the online playerbase seems to have discovered the power of Dredge before everyone else. As word gets out and IRL tournaments adopt the MTGO tech, we may indeed see the deck take off. I certainly couldn’t help but notice the steady stream of 5-0 League finishes as I entered the June data—I doubt the paper scene is far behind. Finally, we come to the Tier 3 decks. These decks are ones with potential, or perhaps past track records of success, but which came up short for a variety of reasons. It may be that they’re poorly positioned in the current metagame. It may be that they’re “glass cannon” type decks that can thrive in small local metas but crumble under pressure from unexpected and diverse metagames. Or, simply, it may be that not enough players chose to sleeve up these decks in a given month, but the ones who did enjoyed success. Either way, these decks aren’t recommended choices for battle unless you know what you’re getting into. Archetype familiarity is probably pretty key to justifying playing one of these decks. At minimum, make sure you have an understanding of why their star hasn’t been on the rise, and if you think you have a solid read on the metagame or have identified an underrated gem, go ahead and pull the trigger. There aren’t too many exciting developments here, really. We see Hatebears, Storm, and Naya Company fall off the tierings, while Jeskai Midrange (featuring Geist of Saint Traft), Blue Moon, and Elves make an appearance. Of course Death’s Shadow (and Grixis Delver) got to jump up the tierings, but beyond that the only other notable change is Death and Taxes and Valakut variants letting slip their Tier 2 claim. As I explained above in the section on Scapeshift and Titan Shift, I think our naming convention right now might be obfuscating the role of Valakut in the current metagame. Here you see that combining Through the Breach and Titan Shift into one category would squarely place the resulting archetype in Tier 2 territory, at 3.7%. These archetypes in many ways form a spectrum of decks that focus more or less on a finite number of interactions involving Valakut. On their own each build seems to be a niche player, but taken as a whole Valakut is a force in Modern today. Death and Taxes, for its part, may soon warrant a naming update as well. Literally every single deck I found under this name included the full Eldrazi package of Displacer, Thought-Knot and Wasteland Strangler. As with Bant Eldrazi in the Tier 2 standings, it appears that the community has solved the riddle of how to build Eldrazi and Taxes—and that sacrificing the explosiveness of Eldrazi Temple and the utility of the multiverse’s newest undercosted villains for a more traditional build yields a worse version. And then, you have the plucky Zur the Enchanter embodying the true definition of “flash in the pan.” Poor Zur is showing a big old zero percent across all categories (having made Tier 3 on the back of his Top 8 finish at one of the Classics). Perhaps his time to shine will come one day? It’s wearing on late for me, so I’ll try to wrap up. The main prediction I have for July is that Dredge will rise to true Tier 1 status. It may be joined by Death’s Shadow at the top, and I expect we’ll see the more reactive strategies shed some metagame share. If the MTGO results are to be believed, principle in this loss of standing will be RG Tron, which seems particularly poorly equipped to thrive in this linear meta. Jeskai Control might slip a bit too, but if I’m being honest I don’t expect Jund to follow the same pattern—it’s always been the premier fair deck capable of surviving even the most hostile broken nonsense, and I see no reason why that would change. Thanks for reading, and thanks for your patience as I figured out how this whole tiering system and data collection worked. July’s update will be on time, and hopefully with some more and better insights on my part. For now, go play some Modern and get brewing, but don’t forget to keep it linear(ish) and proactive. The problem for the deck has ALWAYS been a naming issue, but it’s that the deck isn’t consistently listed as Death and Taxes. Many players playing it have submitted our decklists with Death & Taxes as the archetype only to have it listed under hatebears, flicker, and a number of names that aren’t Death & Taxes. This constantly skews the results it puts up and causes it to be misrepresented. The deck has arguably the best cardpool and most diverse set of choices it’s ever had available in Modern; enough to run it monowhite, white-green, or white-black successfully; and it’s still relegated to Tier 3 status with most unaware of how well it actually performs in the meta. The deck has spent a lot of time justifiably in Tier 3 obscurity, but that’s just not the case right now, neither statistically nor performance-wise. For goodness sake, built properly, the deck is even or better against most of the listed Tier 1 decks. Keep in mind, this is data from June, not July. Although it does seem I’m going to have to go back to the drawing board regarding D&T to make sure we’re classifying it correctly. Another project for the July update. It’s not a problem with your article specifically, just a long-time issue with the deck classification itself. Even if you look just for June, you’ll find that the random naming and cross-listing of this deck skews the statistics heavily and that the results for it here will differ. The reason that so many of the lists that come up “Death & Taxes” are Eldrazi-based is that those are the only versions of the deck that are being listed under that name. The defining difference between D&T and Hatebears is that D&T plays Aether Vial and Flickerwisp while Hatebears, for the most part, does not. Notice none of the sample lists in the primer include either of this cards. While there is overlap in posts regarding Vial and Wisp, generally, this is due to mislabeling from events or articles. It’s just especially frustrating to see the deck drop here when it did nothing but trend upwards last month. Based on the article, this is completely due to, yet again, the annoying mislabeling issue. We are almost done with the month of July and heading into August. How come no data from July is being used here? How long does the process of compiling data actually take? I would have loved to see at least SOME data from the month of July, given that’s the metagame we actually are playing in. Granted, the changes from month to month cannot be so drastic that this data is completely useless, but one could argue that the extrapolation of this data is going to lead to conclusions that are slightly irrelevant because the actual metagame is a whole month ahead of the Metagame Update. First off, modern’s diversity relies in large part on very few tiered decks having 20/80 type matchups. Silver bullets exist to beat all sorts of strategies, which in turn shut down decks and allow wins from out of nowhere. Tron may be the one exception – it has a lot more matchups that skew heavily for or against it. Maybe you should consider reading how these numbers are determined – how often the deck is played, along with results over a long period of time. Two good finishes don’t make a deck the best in the format because modern generally has an “any given day X can win” meta. Hell I play blue tron and that has won some tournaments, 5-0’ed some MTGO leagues. Or better yet, don’t look at these stats as an indictment of you as a player. We all have our pet decks, no reason to get offended. You’re missing the point chief. The best deck in the format isn’t D&T, but the article does not accurately reflect what the deck is. I don’t know if you’re taking over permanently for Sheridan on this front(has he stepped down completely? ), but this was definitely a good read, albeit delayed. Looking forward to July’s breakdown! Been looking forward to this. I’m always glad to see my beloved Merfolk get some shine time, and I expect that to carry on through July (the deck did pretty well at the WMCQs). The huge shares of Zooicide and Dredge are somewhat worrisome, but I think the metagame can adjust by either boosting the shares of decks that perform well against them like Death & Taxes, or just playing more graveyard hate. That said, more pressure on our sideboard slots makes people’s Game 1 matchups more important. I’m surprised Titanshift has sort of fallen off the map, though I guess that a lone Courser of Kruphix or Obstinate Baloth isn’t quite enough to stem the Dredge tide long enough to beat the Dredged-up attackers back. Little worried over the Infect bump, that deck is alarmingly close to being too fast. Hopefully next week will show that Jeskai and Jund held it down or reversed the trend.